Some of my fondest reading memories from childhood are associated with Michael Crichton. JURASSIC PARK is one of those novels I must’ve read at least half-a-dozen times between the ages of 12 and 18. The same goes for THE LOST WORLD and CONGO – – these were the kinds of fast-paced, smart thrillers I lapped up and adored. RISING SUN isn’t a thriller, and so, in my youth, it was a novel I ignored. I shelved DISCLOSURE for the same reason – – if a novel didn’t involve monstrous creatures, my interest immediately waned. My tastes have matured since then – – sort of. 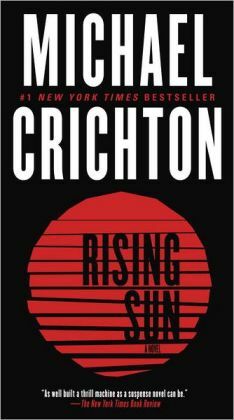 Cut to a decade later, here I am, another Crichton book ticked off the bucket list – – but unlike JURASSIC PARK or CONGO, I doubt I’ll be revisiting RISING SUN in my lifetime. RISING SUN is a mystery, set in mid-nineties Los Angeles, about the murder of a young woman in the boardroom of Nakamoto Tower, a Japanese corporation. We follow Detective Peter Smith and retired Captain John Connor over the course of their three day investigation; being pushed and pulled in various directions, played by suspects both foreign and domestic, all of whom have varying motivations. Crichton highlights the difference between Japanese and Western mindsets, particularly in relation to corporate culture. At times the novel feels like his soapbox, a medium for him to denounce Japanese-American relations, and question foreign investments in the United States’s technology sectors. Connor is well-acquainted with Japanese culture, and frequently articulates factoids, which are at times contrived. The ‘whodunnit’ component of the novel is vastly entertaining – it’s just too often bogged down by lengthy passages of Crichton demonstrating the enormity of his research. In most of his novels, Crichton’s research is demonstrated with far greater nuance – here, it’s like he wants to get everything out, and this hampers plot. Even worse, RISING SUN feels very one-sided; nobody ever stands up and defends the tactics and practices of the Japanese. This began to weigh on my mind as I was reading, which ultimately proved a distraction. RISING SUN is a quick, enthralling read, but ultimately impossible to recommend unconditionally. There is simply too much clutter effacing the core mystery. A shame, because a streamlined version of RISING SUN is a tantalizing prospect.